It doesn't seem that Clint Eastwood necessarily supports or denies this statement, but he certainly maintains this locked-in viewpoint for the large majority of American Sniper. It's a film that's stingy with critical distance - thus fanning the flames for accusations of propaganda. This is certainly hyperbole - the film contains definite glimmers of ambiguity. Consider the funeral scene of a fallen marine, a compatriot of Chris Kyle's, who expresses doubts about Iraq. When a three-volley salute is fired into the air, the mourners visibly cringe and jump. Chris simply stares ahead, eyes concealed by sunglasses -- face hardened at the thought of dissent. There is a dissonance here between Chris' worldview and the implications we are offered. Again, near the conclusion of the film, Chris plays lightheartedly with his wife and children at home - but carries and even casually points a handgun around while doing so, inducing a distinct shiver of uneasiness. And yet, these upbraiding moments seem overwhelmed by Bradley Cooper's sheer macho likability. His status as a reluctant hero and all-around everyman is a bit of an odd contention, given that the real Chris Kyle was a super-soldier with 160 recorded kills - and a man who volunteered for four tours of duty in Iraq. That suggests a psychological profile a little bit different from the 'ordinary guy' routine that Cooper gives us, and although Eastwood goes some way in showing his inability to deal with civilian life, his dutiful weariness rings a bit false in light of the jingoistic devotion his actions suggest. 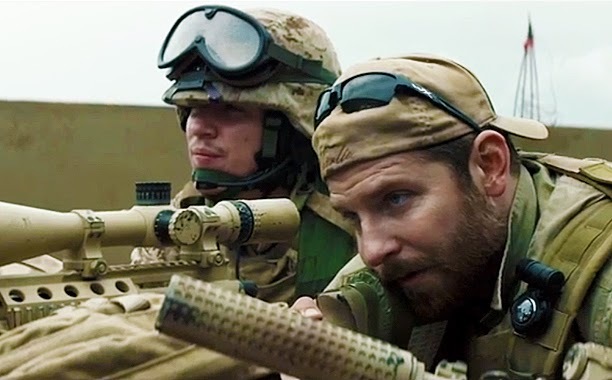 Narratively speaking, American Sniper is hard to fault. It's perceptive about PTSD, the burden on families, and American blue-collar life - particularly its attachment to gun culture, which is a disquieting presence at multiple points throughout. Perhaps most believable of all is the chummy camaraderie between Chris and the other soldiers - right down to its invective about 'savages'. Reality cannot bend itself to our wishes, and in some ways, it's brave of Eastwood to include it in his appraisal of war-time conversation. Tonally, then, politics become inevitable. Eastwood vacillates between moments of liberal doubt and conservative certainty - leaving the film on mixed-up, apolitical middle ground. The conclusion, combined with real footage of a funeral procession, lends itself less to open-ended introspection then it does to dull platitudes about supporting the troops. It's the kind of agreeable flag-waving which purports to smooth things over between left and right, but by its very essence is upholding the status quo. As a result, the film feels unpleasantly vacuum-packed - its vantage point seems strained under the weight of everything it chooses to ignore. Perhaps that's reflective of Chris Kyle's own worldview. American Sniper is an empathetic film that is neither explicitly pro or anti-war; but it seems to fall back frequently on a variation of the 'my country, right or wrong' theme. Whatever ambiguity it has is subsumed by notions of 'sacrifice' and 'valour'. Such big ideas can be dangerous when divorced from the politics that engender them. But the movie's nuances are such that it's difficult to say anything wholly definitive about it; it's an unwieldy work of art that chafes against personal ethics and sensibilities. I can appreciate it - but I can't love it.